I’ve long been a fan of Clare Vivier‘s pieces. Each handbag style is functional, wearable and super chic. On my most recent trip to Los Angeles, I stopped by her headquarters + studio in Silverlake to meet the lady behind it all and get a little sneak peek of her upcoming collections. While perusing the showroom section of her office, my eyes immediately darted to this effortless striped clutch. I actually already own this exact clutch in the leopard calf-hair style and wear it constantly. It’s the perfect neutral (as all animal prints are!) and looks great with pretty much everything in my closet. I think this new cool grey, black and cream combo will work very well this fall while I’m in London, and who doesn’t love stripes? This clutch comes in nearly 80 different fabrics, prints and colors – there are so many options that it’s actually impossible to not find one you love! 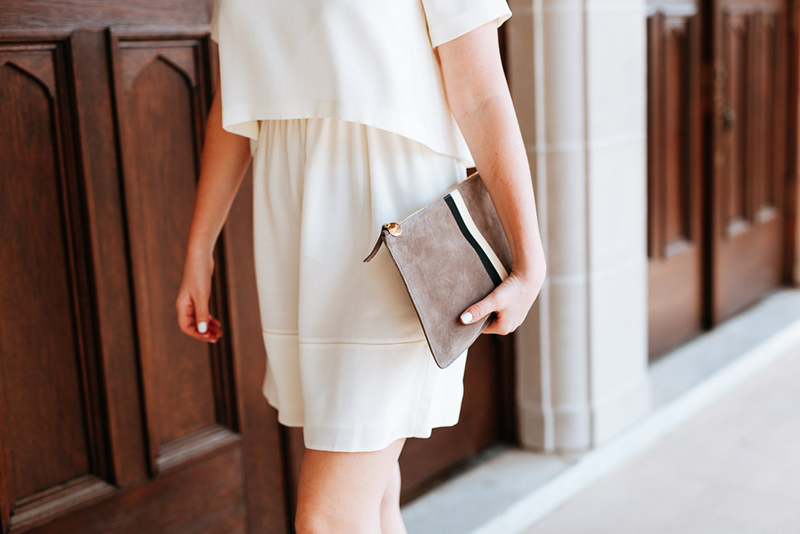 A few other styles I’m loving from Clare V right now include this calf-hair crossbody, this clean + classic tote, and this foldover clutch that also has endless style choices. Love this simple look, that little white dress is adorable. simple and beautiful! looks so effortless! love the sunnies! perfect! those heels & that clutch…LOVE. Such a gorgeous feminine dress and the church backdrop is so stunning. I agree, it’s impossible not to find one that you love! The shape of this dress looks amazing on you :) I checked that red ASOS dress, but I was bummed to find out it doesn’t come in other colors – dang it! Love you in all white! So feminine and pretty!! Such a gorgeous dress! I love the shape and draping. Clare V clutches are all so dreamy. I haven’t seen one combination I don’t like. This stripe was the perfect pick, and how cool that you got to meet her! I think I’m going to swing by the Clare V. store when I’m in NYC! I’ve been lusting over her clutches for awhile now. I love Clare V. I also love this white dress! So cute. I love the shape of your dress! I have a black one with that cropped overlay and love! The clutch of course is amazing. Gorgeous! I love this simple and chic look! That dress is the perfect wardrobe staple and the striped clutch gives this ensemble a fun twist! This dress is phenomenal on you — i LOVE that photo of you with the big effortless smile… you look gorgeous, Merritt! ps: need to get my hands on one of her clutches; loving this striped version. Her bags are definitely classics in the making! you look so chic! I really love yor white dress. I’ve been obsessing over LWDs lately! I love her pieces too, I have started quite a collection. I like the dress and clutch. Yes! Clare V. clutch is awesome. I have been SUCH a fan of Club Monaco lately – they’re really killing it. My wishlist there is just utterly insane at this moment… That dress is just gorgeous!!!! You look amazing and those shoes are gorgeous! I love the Clare Vivier brand too. Her leaopard foldover clutch is classic, but I’m loving this striped leather in the mushroom tone. Beautiful! I love that dress on you, it fits perfectly. I also love the location. Beautiful look! Simple and chic. Also, love the clutch! I love how effortless and comfortable this dress looks while still being super chic and elegant!